How about a nice late winter or early spring RV vacation to New Mexico? Here you can explore several National Monuments, Preserves, Historical Parks and Carlsbad Caverns in this remarkable southwest state. Located in southeastern New Mexico, Carlsbad Caverns has aptly been called the Grand Canyon with a roof on it. This underworld cache lies beneath the Guadalupe Mountains and is one of the deepest, largest and most ornate caverns ever discovered. For a long time, the area that would become Carlsbad Caverns was more hearsay than an accepted national treasure. Curious explorer Jim White discovered and explored the caverns throughout his adolescence and well into his adult life. Through storytelling, self-promotion, and exciting guano exporters Jim White was finally able to convince people of the cavern’s significance and geological value. On October 25, 1923, President Calvin Coolidge signed the legislation that created the Carlsbad Cave National Monument and the area was finally awarded full National Park status by the United States Congress on May 14, 1930. White discovered and named many of the cavern’s vast interior spaces that would go on to eventually become a UNESCO World Heritage Site in 1995. The best times to visit Carlsbad for ideal weather are March 12th to June 3rd or September 17th to November 4th. So, plan now to get there in March and you will be treated to average temperatures with highs around the low 70s and very few rainy days. During spring, the desert is in bloom and is even more stunning to see. Carlsbad Caverns National Park is in a semiarid region that can get quite warm in the summer with daily highs around the mid to upper 90s, but it’s always cool in the cave. The interior of Carlsbad Cavern is very stable and hovers around a cool 56 degrees with the deeper sections holding around the low 60s. Summer also brings the highest bat populations to Carlsbad so you’re sure to get a great show at dusk and dawn when the bats leave and return. There are many other treasures to see in New Mexico. Some are National Monuments such as: Aztec Ruins, Bandelier, Capulin Volcano, El Malpais, El Morro, Fort Union, Gila Cliff Dwellings, Petroglyph, and Salinas Pueblo Missions, among others. As an example, Petroglyph, near Albuquerque, protects one of the largest petroglyph sites in North America, featuring designs and symbols carved onto volcanic rocks by Native Americans and Spanish settlers 400 to 700 years ago. These images are a valuable record of cultural expression and hold profound spiritual significance for contemporary Native Americans and for the descendants of the early Spanish settlers. There are also National Preserves and National Historical Parks and Trails in New Mexico worth visiting, including Chaco Culture, El Camino Real de Tierra Adentro, the Manhattan Project, Old Spanish Trail, Pecos, Sante Fe, and Valles Caldera. Valles Caldera is a 13-mile wide circular depression that was created about 1.25 million years ago by a spectacular volcanic eruption. The preserve is known for its huge mountain meadows, abundant wildlife, and meandering streams. The area also preserves the homeland of ancestral native peoples and embraces a rich ranching history. Many of these are worthy of a full day of exploring with trails worth traveling to learn about the ancient history of this region. Check out more about these New Mexico riches at National Park Service – New Mexico. Brantley Lake State Park: This is on the southernmost lake in New Mexico, and is an oasis of water, wildlife, plant life and gorgeous sunsets as well as stunning night skies. It is located 12 miles north of Carlsbad at an elevation of 3,295 feet. Another great option is the Carlsbad KOA which is not only great for its proximity to the park but has great amenities as well. You would be very close to the Living Desert Zoo & Gardens State Park as well as the Sitting Bull Falls Recreation Area, Roswell’s International UFO Museum and White Sands National Monument. Rental of an El Monte RV is no problem if you wish to explore the fascinating terrain of New Mexico. Dallas and Phoenix are our closest locations. You can explore Tucson and the Gila National Forest on your way from Phoenix to Carlsbad. Check Phoenix RV Rentals for availability for your travel dates. Or see Dallas RV Rentals for available RV’s in Dallas. As you get ready for your next RV adventure, are you thinking about what to do with your pets? Is little Felix rubbing up against your leg as you browse the Internet thinking of far off destinations for your adventure? What about Rover? Is he going to have to stay home and miss all the fun? We get it! Your pet is a part of your family and you can pack up the treats and leashes and your furry companion can come along and travel in the motor home with you. There are lots of spots that allow pets to come along. RV campers willing to follow the same common-sense rules they observe with their pets at home shouldn’t have a problem including their animals on vacation. Check out our Pet Friendly RV Vacations page to see some great potential destinations that will welcome your pet. Are you one of those people who loves to see dogs on parade? Well, you can travel in RV luxury to see the excitement and glamour of many top dog shows. The American Kennel Club sponsors dog shows throughout the U.S. These shows display the very best in dog show competition and give credibility to this rapidly growing sport. Agility trials, conformation events and several other categories of shows promise something for every type of dog lover. To learn more about specific locations of the AKC shows each year, check out our Traveling by RV to Dog Shows page. Make sure your pet is secure when you’re riding in the RV. No, you shouldn’t just let your animal roam about freely. They could be injured and can also be a distraction for the driver. Keep them in a kennel or secure them with a harness or leash that buckles into the seat belt. That fuzzy sweater that they love? Make sure your pet has up to date shots and an updated ID. Consider chipping your dog or cat to ensure that in that awful situation when he or she may get lost, you can always retrieve them. Minimally, if chipping doesn’t appeal to you, you should go to your local Wal-Mart or PetSmart, find the pet ID kiosk, type in their name on one side with your name and phone number on the other, print it, stick it on their collar, and voilà! Your pet has his/her own personal ID. Vaccination records- many campgrounds may ask to see recent vaccination records and rabies shots. Proof of ownership – Yes, someone could claim your animal was theirs! If you carry proof, this won’t go far. Photographs – keep some cute pictures of your pet on your phone – and consider printing one or two good pictures in case they run away. If your pets have allergies or medical issues bring the paperwork about that too. A first aid kit – not just your standard personal one but one that includes pet items too. And there are many other tips you can find by just searching for pet friendly RV’ing. Now you’re all set to go on your pet-friendly adventure but where’s the RV? You can easily rent one of our RV’s at numerous locations around the US. 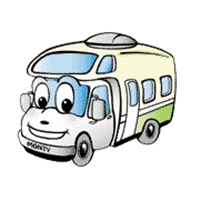 Check out availability for your travel dates on our Where you can Rent RVs page.